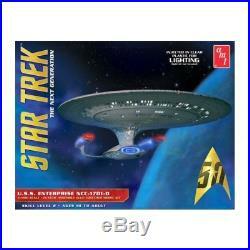 New Star Trek USS Enterprise 1701-D Clear Edition 1:1400 AMT Plastic Kit AMT955. Celebrate the 50th anniversary of Star Trek with exciting model kits from AMT. Under the command of Captain Jean-Luc Picard, the U. Enterprise NCC-1701-D was the fifth starship to be named Enterprise to explore strange new worlds and to boldly go where no one has gone before. The Galaxy-class Enterprise-D was twice the length and had eight times the interior space of the Constitution-class ships of over a century earlier. She carried a combined crew and passenger load of 1012. Defensive systems included 11 phaser banks, 250 photon torpedoes and a high capacity shield grid. The Enterprise-D had a nominal top speed of warp 9. This all-plastic kit of the U. Enterprise-D is over 18 inches long when fully assembled, and features a removable saucer section and dome base with ball jointed metal support rod. This special edition is moulded in clear plastic, which allows the modeler the option of lighting the kit. Kit includes standard marking decals and complete instructions. Injected in clear plastic for lighting (light kit not included). Dome base with ball jointed metal rod included. All pennant, registry, marking and life boat decals included. Plastic model kit without paints or glues. Will require basic tools, suitable paints and glues to complete. ARROW MODELS is a family owned business established in 1990 and located near the beautiful seaside resort of Scarborough, North Yorkshire, England. Be confident that you are dealing with retail professionals with many years of experience who understand your needs and will provide excellent service and after sales support! We do not accept cheques or postal orders. Same day despatch is not guaranteed although we aim to despatch orders within 24 hours, excluding weekends and public holidays. The vast majority of orders are delivered within the period for the stated service e. 24 or 48 hours but we will not be held responsible for delays outside of our control e.
If there is no one at home then a card will normally be left advising you how to arrange collection. Upon receipt of your order, please take great care to check that it is correct. All products comply with UK laws and are primarily intended for use in the UK. We offer no guarantee as to their suitability for use in other countries. Please pay particular attention to the differences in domestic voltages and plug types for electrical items. The item "New Star Trek USS Enterprise 1701-D Clear Edition 11400 AMT Plastic Kit AMT955" is in sale since Monday, May 22, 2017. This item is in the category "Toys & Games\Model Kits\Models". The seller is "arrowmodels" and is located in Scarborough.